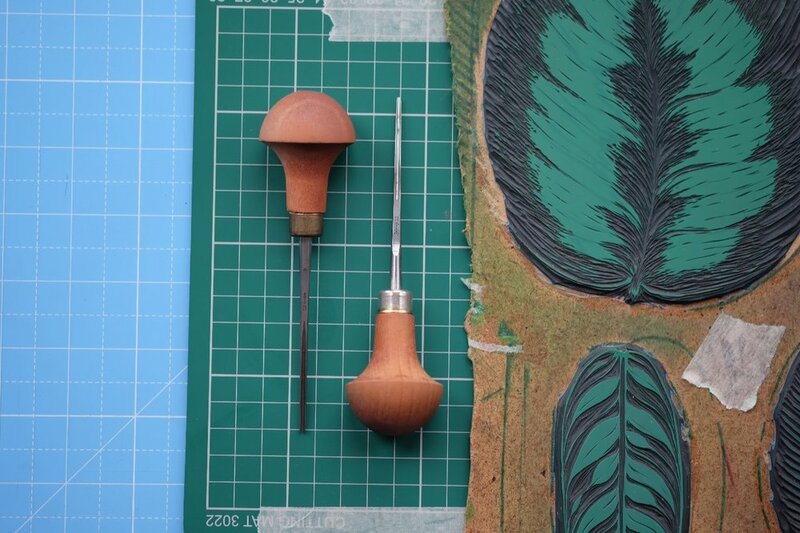 The question I get asked most is which tools I recommend and how to get started with linocut. Here is a breakdown of the tools most commonly available, across all budgets. If you have any further questions, please comment below! If you're new to print making and you are not yet sure if you want to make a big financial commitment, I recommend the ‘Essdee’ basic cutter. Cheap and cheerful – they are convenient to use and dependable, as well as not breaking the bank. The basic tool costs £4.50 and comes with 5 different blades. Essdee also have a Printmaking kit which is around £20 and includes all the basics you'll need to create a print. Your results might be a bit rough around the edges but for the price it makes a great starter kit or even a great present – it is how I first developed my interest in print making. - You have to switch out the blades each time you want to use another one. - The tools are not as fine as other tools available. If you’re happy to spend a bit more from the outset, I recommend jumping straight to these very adaptable and hard wearing tools. 'Pencil type' cutters are typically from China and come in a pack of five. They usually cost around £10, and the first benefit you’ll notice is that you won’t have to swap the blades out as with the Essdee cutter. The blades are sturdy enough that you can actually hone them yourself with the small stone which comes in the pack. These are a great basic set to own. I still use mine regularly and you will find the large flat cutter particularly useful for clearing large amounts of space. I consider it a real must-have set for any tool collection. At around £10-15 per tool, it can get quite expensive to have a whole set of these so I recommend investing in a few of your preferred tools and using ‘pencil type’ cutters for your more everyday use. Some printmakers find the mushroom handles much more comfortable to use, and the quality greatly improved from the ‘pencil type’ cutters listed above. The main benefit of splashing out on these is how fine the blades are. You can get both ‘U’ and ‘V’ tools as fine as 0.5mm which gives an amazing result and finish making very detailed cutting far easier to achieve. You will need to periodically hone your tools to keep them keen, and with such a long blade, you are never going to wear these down even after a lifetime of use, no matter how often you sharpen them. The finest tools however, 2mm – 0.5mm, can be a little difficult to sharpen effectively yourself. Professional sharpening services are available, and this is well worth investing in to obtain the best results, unless you are already confident and proficient in sharpening small cutters yourself. At between £30-40 per tool, these are the priciest tools available. As with the Pfeil cutters, they come in fantastic detail (up to 0.5mm). The blade actually continues into the handle of the tool, and you can adjust how much blade is showing and extend the metal as the blade gets worn down over its lifetime. These are generally labelled as ‘woodcut’ tools, though they can be used for linocut as well. These are a huge improvement in terms of quality and the blades hold their sharpness a lot longer than any of the other tools. As with the ‘Pfeil’ cutters, you will find that the finest tools should be sent off for sharpening to maintain good and keen blades, as well as their excellent finish! If you’re brand new to printing and you’re not sure if you want to invest longterm, the ‘Essdee’ Printmaking Kit is a great introduction to this interest and creative hobby. Otherwise – I highly recommend buying an inexpensive set of ‘pencil cutters’ and if you find you enjoy doing more detailed carving, then investing in a couple of finer ‘Pfiel’ or Japanese Woodcut tools. - Tape plasters to your tools if you find they are rubbing! - Never hold your other hand right in front of your cutting direction (otherwise ouch! ).